On 30 August 2014, an attempted coup in the Kingdom of Lesotho, led by an elite group within the military, threatened the country’s already fragile stability. Parliament hadn’t been functioning for an extended period, which triggered a political crisis. Led by Lieutenant General Tlali Kamoli, the coup resulted in the exile of Prime Minister Thomas Thabane to South Africa. Following negotiations with mediator Cyril Ramaphosa, the parties agreed to hold elections on 28 February 2015 (as agreed in the Maseru facilitation declaration and the Maseru security accord), two years earlier than originally scheduled. The recent attempted coup resurgence of conflict in Lesotho suggests that previous attempts to resolve tensions have been superficial, and have insufficiently addressed the root causes of the crisis. Elections are only one part of what should be a much broader strategy to address the conflict. There is therefore a risk that the February elections might be a quick fix attempt at a solution that once again fails to address the deeper problems facing the country. The main causes of the kingdom’s tensions are its governance structures. A coalition government has ruled since May 2012, consisting of the three dominant parties: the Basotho National Party (BNP), Lesotho Congress for Democracy (LCD) and All Basotho Convention (ABC). The parties clashed over the appropriate distribution of resources within the coalition government. This division became increasingly visible at the beginning of September last year between the parties of the Prime Minister Thabane (ABC) who is allegedly supported by the police, and Deputy Prime Minister Mothetjoa Metsing (LCD), who is said to have the loyalty of the military forces. This has contributed to a breakdown in the security structure, creating an especially hostile relationship between the military and police. The recent coup attempt was not the first time the people of Lesotho have experienced insecurity. 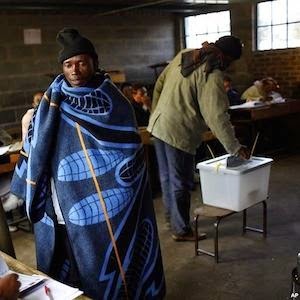 In 1998, the country experienced a political crisis after some Basotho alleged that election results had been fraudulent. Some 113 people died in post-election violence, where the Southern African Development Community (SADC) and South Africa intervened. The coalition government that was formed in 2012 was a way of addressing some of the political tension from 1998. A peacebuilding strategy must be included in any attempt to resolve the Lesotho crisis. The United Nations (UN) defines peacebuilding as action to strengthen peace and avoid relapse into conflict, while other literature refers to peacebuilding as a range of measures targeted to reduce the risk of repeated conflict by strengthening national capacities at all levels. Therefore the kingdom’s peacebuilding strategies should also include dialogue, capacity-building, good governance, reform in the justice and security sectors, and socio-economic development. A fundamental challenge in Lesotho is the issue of good governance and power sharing, despite the 2012 formation of a coalition government. In July 2014, just a month before the political crisis took place, there were already early warnings issued by the Commonwealth Envoy to Lesotho. In their report titled Governance in Lesotho: Repositioning for Success, the panel made several recommendations, including that the government’s Parliamentary Reform Committee should undertake a review of Lesotho’s parliamentary processes and institutions to prevent political instability within the government. According to Thabang Matjama from the Open Society initiative for Southern Africa, one of the challenges with a coalition government is that parties use state resources to accumulate power for themselves. Lesotho is a case in point, where the three parties seem more concerned with gaining power than addressing the needs of ordinary Basotho. Other peacebuilding strategies can be creating national dialogues between civil society, government and the private sector, which will allow people to come together and build strength, unity and healing after conflict. Peacebuilding practitioners such as the UN argue that a lack of inclusivity causes peace agreements to fail, and that inclusivity is essential to any long-lasting solution to conflict. In the Democratic Republic of Congo (DRC) and South Sudan, peace agreements also arguably failed because they did not initially include all the relevant parties to the conflict. On 17 October 2014, Cyril Ramaphosa, South Africa’s Deputy President and the SADC facilitator of the peace negotiations, announced that Kamoli had left the kingdom along with two of his rivals as part of a deal to restore security. It is unclear how Kamoli’s departure affects the prospects of much-needed dialogue. If the root causes of the conflict are to be addressed, Ramaphosa and his team should create a platform that enables all parties to engage in open and transparent dialogue sessions, which will expose the fundamental triggers of the country’s unrest. Greater attention should be paid to developing peacebuilding strategies that address a lack of inclusivity. In solving the Lesotho crisis, it is imperative that all relevant parties are involved. Moreover, civil society and government should work together to find solutions and address the fundamental challenges faced by the military and the police force, and their loyalties to the prime minister and his deputy. Successful elections next month will be an important milestone for establishing stability in Lesotho, but will only be successful if they form part of a broader process. Peacebuilding activities – formal and informal dialogues, engaging in coalition building, reconciliation, and the inclusion and participation of the relevant local actors – have not yet been considered in the facilitation processes. Therefore, as it prepares for the elections, Lesotho must seriously engage in peacebuilding processes to prevent a resurgence of violence. Reforming the parliamentary system should be the first step.